Online Outsourcing: How Can Developing Countries Benefit? In 2014, 40,000 Kenyans were registered on Elance, an online platform coordinating virtual employment for people living continents apart from their employers. With internet accessibility increasing worldwide, this kind of employment is becoming a more attractive possibility for the 201 million people unemployed in 2014. McKinsey and Company wrote a report in 2013 suggesting that the internet could play a key role in economic development, especially in Africa. Africa’s iGDP, the internet’s contribution to the overall GDP, is currently 1.1 percent. This study estimates that by 2025, Africa’s iGDP will rise to somewhere between five and 10 percent. While only 16 percent of the continent has access to the internet today, estimates based on the rapid dissemination of mobile technology say that Africa has the potential to dramatically increase that number to almost 50 percent by 2025. 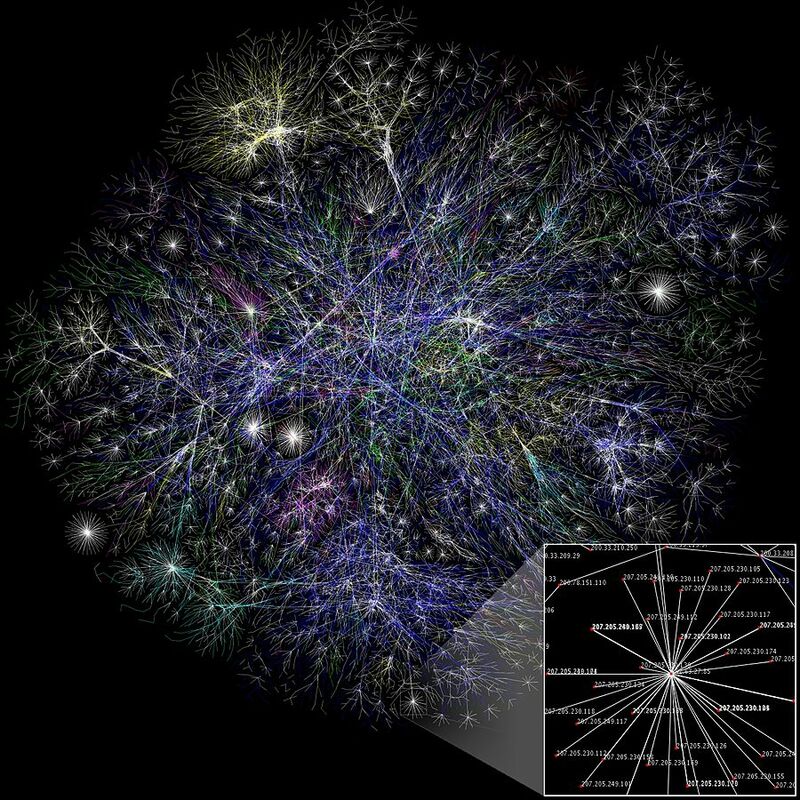 A visualization of a portion of the internet maps connectivity that spans the globe. The internet is crucial for economic growth in today’s global economy; McKinsey says that up to 10 percent of the total GDP growth in China, India, and Brazil in the past five years is due to the growth of the internet. Developing the internet in Africa, as well as in other developing regions in the world, could inspire similar growth. Beyond merely increasing internet access for economic growth, big names in global development are thinking about how the internet can transform the job market. The World Bank and the Rockefeller Foundation just published a study on online outsourcing. Chinese Investment in Africa – Where Do the Jobs Go? Chinese official foreign direct investment (OFDI) stock in Africa reached $21.73 billion in 2012, and China’s Premier Li Keqiang stated that total investment will reach $100 billion by 2020. Over 2,000 Chinese companies have invested in sectors such as infrastructure, natural resource extraction, finance, and power generation. On June 3, German software giant Systems Applications Products (SAP) announced “Digital Africa,” a partnership with the German Ministry for Economic Cooperation and Development (BMZ) that seeks to support the development of Africa’s digital potential. This program—one of SAP’s $500 million investment initiatives—will train 20,000 children in 11 African countries, underscoring growing recognition of the role of Information, Communications Technology (ICT) in driving broader development in Africa. The new partnership comes in recognition of the significant opportunity ICT driven initiatives present in Africa, both in terms of development impact and profit potential. Here’s a review of that opportunity, and the trends that are driving it. Access to mobile ICT technology has the potential to transform African economies. A recent USAID study points out that 80 percent of employers in Southeast Asia want to hire more workers, but only 15 percent think education systems are adequately preparing the workforce for available jobs. This difference between employers’ needs and the workforce’s skills is known as a ‘skills gap,’ and workforce training programs are one of the best ways to minimize this gap. Donors and host country governments have leaned on STEM-AT (science, technology, engineering, mathematics, accounting, and tourism) training initiatives to meet these needs, to meet private sector demand, and to create more competitive economies. In 2014, USAID established the ‘Connecting the Mekong through Education and Training’ (COMET) program to help meet these needs and help create a more competitive workforce in Southeast Asia. The five-year initiative works closely with the private sector to train students in 12 universities and 90 vocational centers across Vietnam, Thailand, Myanmar, Laos, and Cambodia in STEM-oriented programs to help secure employment in the region. USAID has organized workforce training in the past, but in the last five years has renewed efforts to build a workforce to meet the specific demands of the markets in developing regions. In addition, the initiative builds on the Obama administration’s ‘Young Southeast Asian Leaders Initiative’ (YSEALI) and the Lower Mekong Initiative (LMI) to enable job-ready graduates with practical education. Students at Saigon International University in Vietnam. Yemeni Refugee Crisis: What Assistance Can We Provide? The ongoing conflict in Yemen, particularly after the launch of Operation Decisive Storm on March 26, 2015, has inflicted serious humanitarian toll on ordinary Yemenis. According to the United Nations, 45, 0000 people, in addition to 33,0000 people previously displaced, including foreign citizens living in Yemen, have been displaced in the recent conflict and even more are entangled in war zones.